Halfway through his autobiography Face the Music: A Life Exposed, Paul Stanley discusses KISS Alive!, his band's breakthrough 1975 live album recorded variously in Detroit, New Jersey, Iowa, and Cleveland, writing honestly about the post-production sweetening that gave that album its raise-the-roof oomph and stomping vibe. Other KISS band members have weighed in on this album in the past. "[Gene] Simmons claimed in his tell-all that tracks were redone simply to remove a few broken strings and the occasional off-key slip," Dylan Chadwick wrote in "In Defense of Live Rock Overdubs." "More damning accounts from Peter Criss and Producer Eddie Kramer suggest that only the drum tracks are purely live." 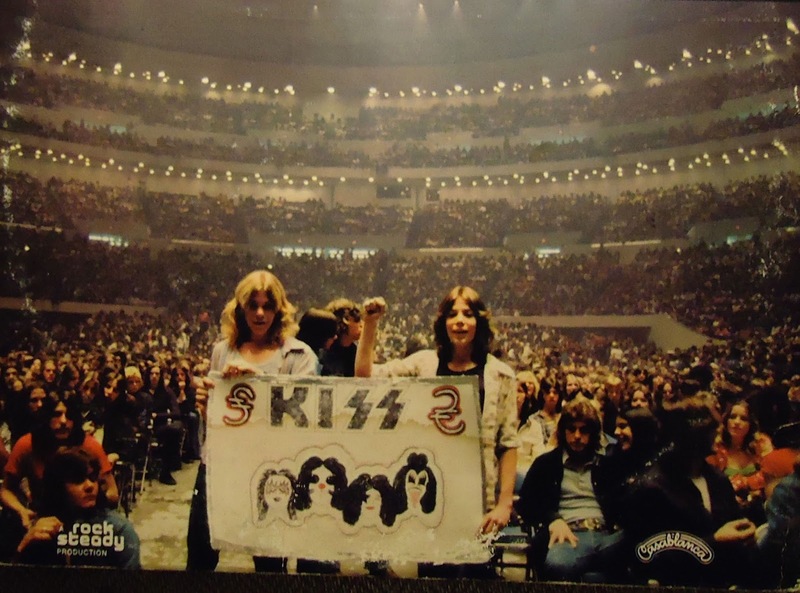 (KISS Alive! has been scrutinized often; here's just one example.) Many producers of live albums resort to thickening, correcting, or otherwise manipulating recorded tracks in order to present a more listenable album. This isn't news. Musicians often sound defensive about the process, when they're being honest about it at all, as if they're guarding an embarrassing secret. I really like Stanley's perspective. He remembers that what you take away from a show is less the notes played (or fucked up), less the degree of fidelity to album tracks, less the songs themselves than the playing of them—all of which often amounts to an abstracted recollection of a spectacle, sonic impressions played over and over in your head starting on the walk, drive, or subway ride back home from the show, on a loop for years. Intangibles like the wafting of weed, pushing up against people next to you, the sweat, ringing ears, the deep, letting-go pleasure in your bones of forgetting about work or other pressing matters are impossible to record onto tape or in the digital domain. Stanley gets that. "People have argued whether Alive! is a purely live recording or somehow enhanced," Stanley writes. "The answer is: yes, we enhanced it. Not to hide anything, not to fool anyone." But who wanted to hear a mistake repeated endlessly? Who wanted to hear an out-of-tune guitar? For what? Authenticity? At a concert, you listen with your ears and eyes. A mistake that passes unnoticed in the moment lives forever when recorded. We wanted to re-create the experience of our show—whatever needed to be done, we did it. The ﬂashpots were enhanced with recordings of cannons, because that’s what they sounded like in person. The audience was jacked up to immerse the listener in the crowd. It was the only way to replicate our concert-on-steroids. We ﬁgured the people who celebrated with us at a concert wanted to hear what they remembered, what they perceived. We also made sure the audience could be heard throughout the show—just as you would experience it live. Most live albums in those days sounded like studio recordings until the song ended, when some applause could be heard between songs. But we wanted to portray the real concert experience. And the back cover paid tribute to those fans who made all that noise and turned our shows into such powerful communal events. Alternate photo KISS fans at the Alive! 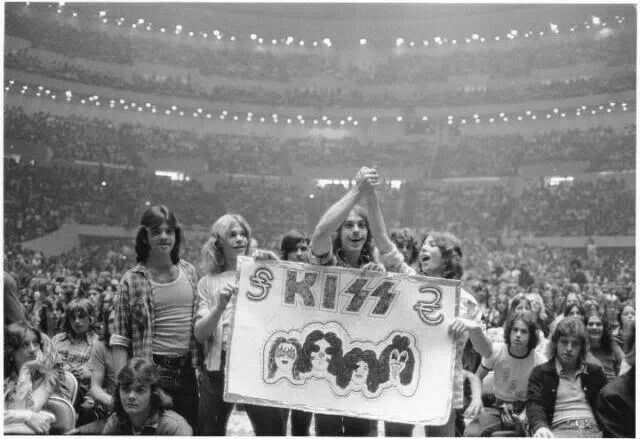 show, in Cobo Hall, Detroit. Via Pinterest. Stanley properly credits Kramer as the mastermind behind this, and the details of the producer's post-production methods are fascinating. "His brilliance in the studio and his innovations in enhancing the recordings were not only ground-shaking, but groundbreaking," Stanley writes. He had different audience sounds on tape loops that were sometimes twenty feet long, held taut on mic stands and going around so you would never hear a repeat of any fan response. He had all these mic stands set up in the studio with different lengths of audience participation tape running on them so we could bring in actual crowd reaction, whether it was a murmur or a roar. I certainly would never have thought of that—to create different loops of tape and have them going continuously so we could raise or them and lower them and get different crowd reactions at will. It was brilliant.